Makes a versatile mini PA too! The Roland CM-30 Cube Monitor delivers 30W of audio punch through a rugged, high-quality 6.5" coaxial 2-way speaker with stereo preamp. The CM-30 is designed for home-studio and wide-ranging monitoring applications, but it can be used for live monitoring onstage as well. 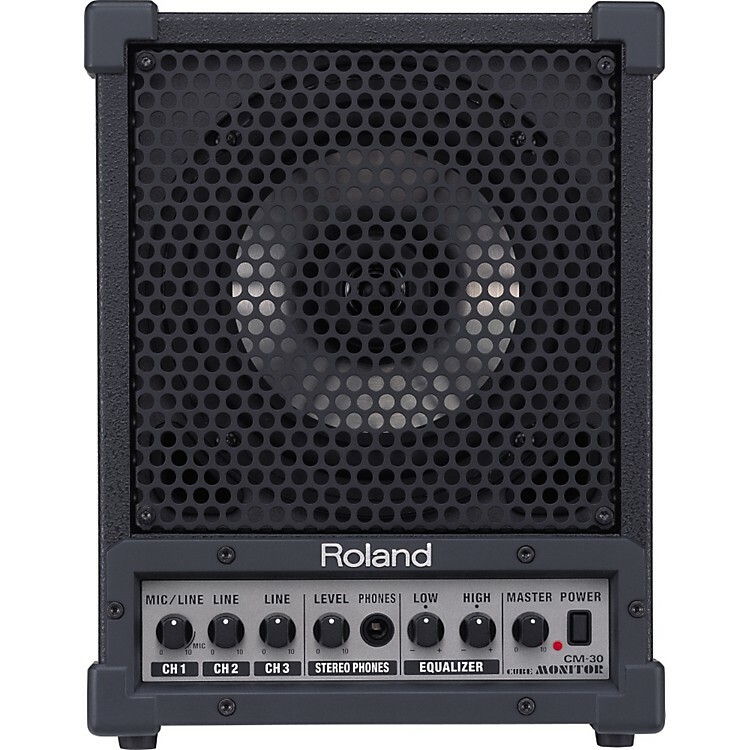 The Roland CM-30 monitor speaker offers more than enough inputs to simultaneously connect a microphone, a keyboard, a rhythm machine, and a CD player, or to function as a mini-PA rig. It's equipped with 3 input channels, with one XLR mic/line input and 2 additional AUX RCA and stereo mini-phone inputs, making a total of 5 simultaneous inputs possible (4 stereo and one mono input). The Stereo Link function allows 2 CM-30s to be linked for true stereo output, which enables a total of 10 inputs. Sound can be further refined with the Roland speaker's onboard 2-band equalizer. As with all other controls, the EQ knobs are conveniently located on the front panel for quick access. The Roland CM-30 can be easily and safely toted from location to location thanks to its built-in handle grip, protective metal grille cover, and cabinet corner protectors. Other handy features include a stereo headphone jack and mic stand adapter.